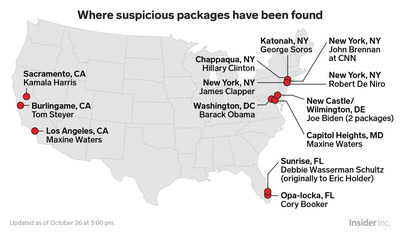 FBI Director Christopher Wray shot down “false flag” conspiracy theories about a series of attempted mail bombings of high-profile Democrats and other public figures this week. Cesar Sayoc Jr., 56, of Aventura, Florida, was arrested on Friday in connection with the attempted attacks. FBI Director Christopher Wray on Friday shot down conspiracy theories about a series of attempted mail bombings of high-profile Democrats and other public figures this week. “Though we’re still analysing the devices in our laboratory, these are not hoax devices,” Wray said. His comment came as law-enforcement officials released details about Cesar Sayoc Jr., 56, who was arrested earlier in the day in Florida and faces charges in connection with the slew of suspicious packages intercepted in several US cities. Several prominent conservatives, including Lou Dobbs of Fox Business, have suggested that the reports about the attempted attacks were planted by Democrats to make Republicans look bad. Dobbs even referred to the explosives as “Fake Bombs” in a tweet he later deleted. President Donald Trump was criticised on Friday morning after tweeting that “this ‘Bomb’ stuff” was distracting the media from political news ahead of the midterm elections next month. After Sayoc was apprehended, Trump applauded law enforcement. At least 14 suspicious packages have been found since Monday. All were addressed to people who’ve been verbally attacked by Trump and have been vocally critical of the president. Sayoc, who registered as a Republican before Florida’s primary elections in 2016, has been arrested several times in the past, public records show. Wray said that DNA evidence, including a fingerprint on one of the envelopes in the investigation, helped law enforcement track down Sayoc.